Craig Newitt could not have hoped for a better start to 2013, partnering the two feature winners on today's traditional New Year's Day program at Flemington. The tireless hoop, who narrowly missed out on claiming last season's metro jockeys' title, completed the feature double with a stunning Standish Handicap win aboard the Danny O'Brien-trained Adamantium. That victory came 40 minutes after he scored an upset win in the $150,000 Listed Bagot Handicap (2800m) with the Peter Gelagotis-prepared Module. Newitt powered home from the back to win the Bagot, but he ran his rivals off their hooves in the Standish to continue Adamantium's rise as a sprinter of the highest quality. The son of Elusive City produced a sustained display of speed to cruise to a 2-1/2-length win in the $150,000 Group 3 event, which was run over the famed ‘Straight Six'. The victory made it two consecutive dashing straight track wins for the four-year-old, who O'Brien described as a different since being gelded and kept to sprint trips. 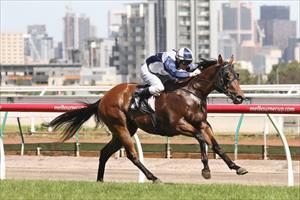 “He's a more mature horse now since he's been gelded,” the Flemington trainer said. “His three-year-old form was really good and he's certainly showing that he's come on as a four-year-old. “We messed him up a little bit as a three-year-old, we tried to get him up to a mile – he ran in the Guineas here and he ran in a mile race in Queensland – but I think we've worked out that he's really a six furlong and obviously a very effectively straight horse. Adamantium ($7 to $5.50) earned all the praise for his win, but there were some fantastic runs behind him. Defending champion Catapulted, the $2.20 favourite, tried hard but could do no better than second placing, while the Bart Cummings-trained Goldstone ($21) was super first up to claim third, 2-1/4 lengths behind Cataplulted. Former Hong Kong champion Good Ba Ba ($31), the 11-year-old who was having his first run for Rick Hore-Lacy, charged home to finish fourth. Given how well Adamantium is going and his appreciation for the straight course, O'Brien is likely to give him his shot at the $1 million Group 1 Newmarket Handicap (1200m) on 9 March. “We thought we'd get a good line on him today, if we could take on a horse like Catapulted – obviously we were well treated at the weights – but to put him away suggests that he's capable of going to the better sprints in the autumn.